Upstairs features two bedrooms and a full bathroom. Both bedrooms are furnished with Queen size beds, TV and DVD player. All linens are supplied - even warm, flannel sheets for those cold winter nights. Snuggle up in front of the gas log fireplace - enjoy the beauty and comfort of a wood burning fireplace without the work and mess. The kitchen is fully equipped and many condiments are supplied. Relax on any of the three decks - swinging on the porch swings or rocking in the rockers. Entire cabin is wood (no drywall) for a true rustic feel and downstairs has been renovated in white pine. The bedroom downstairs is furnished with a King size log bed, dresser and TV with DVD/VCR combo. Attached with master bedroom is a second bathroom (shower only). The entertainment area has a wet bar with microwave and refrigerator, TV with DVD/VCR and air hockey/pool table. There is a deluxe sleeper sofa and matching loveseat to provide additional sleeping areas-great for the kids to stay up and watch the many movies available. The entertainment area opens onto a large screened deck with another porch swing, a picnic table and rocking chair. Step down to a third deck where you'll find the gas grill and hot tub and additional seating. The perfect place for a single couple (party of 2) or a family (or two), come enjoy Fishing Bear and have a vacation you'll remember..
*When checking rates, please read "NOTES" for full description and breakdown, thanks. Pet fees are listed under NOTES. Quote will need to be updated if pets to be included in rental. We have loved the mountains and decided to buy in the Blue Ridge area because of all it has to offer - easy access, shops, hiking, tubing, rafting, antiquing, vineyards and wine tastings, festivals and so much more. We fell in love with the cozy, comfort of this cabin. It is very easy to get to with a four lane highway right up to the turn to go up the mountain. Once you leave the highway it is like being in another world - quiet, peaceful. We have tried to make our cabin a home away from home and provide all the comforts of home. Easy access to the cabin as well as down the driveway to park. Quiet and serene yet close to many activities, shops, local events, etc. Both bathrooms have hair dryers provided. Semi secluded setting with Fishing Bear Cabin nestled amongst the oaks, maples and birch. Easy access on paved road. Very limited in winter. Spectacular mountain view across the road. Gas with emergency back up. All linens, warmer weather and flannel for cooler months. All bedding has been protected with mattress protectors, deluxe water resistant mattress pads. Driveway easy to navigate. It is not steep. There is also parking along the road. Both bathrooms are fully stocked with towels, wash cloths, hand towels and bathmats. Gas log (with remote) fireplace. Note: Pilot light is off May through September. Self cleaning. Broiler pan available. Kitchen equipped with microwave. Wet bar downstairs has one as well. Completely stocked kitchen. Complete set of dishes, drinking glasses, coffee mugs, bake ware, pots and pans,utensils, etc. High top table and chairs. Seats 8 comfortably. Also have a table on the upstairs outside deck for outside dining. In addition, a full size picnic table is on the downstairs screened deck. Large reading library for your enjoyment. Many guests take a book and leave one in it's place. Downstairs air hockey table/pool table/ping pong combo. Board games such as Scrabble, Trouble, Aggravation, Balderdash, Risk, Checkers, Chess, Backgammon, Yahtzee, Scrabble Jr. and many more. Covered deck upstairs and down; screened deck downstairs also. Three decks - upstairs open air, down screened and another open air ot tub deck with pub table and grill. Wired for electric - listen to music, use your computer to watch a big game, etc. Upstairs is open air, downstairs is screened with picnic table, swing and rocker and opens onto another open air covered deck with the hot tub, grill, loveseat & Handcrafted Pub Table & stools. Ski resort in Maggie Valley - brochures in the cabin will give details and directions. Golfing in the area - Ellijay, Blue Ridge, Blairsville, etc. We really enjoyed this cabin and our time in blue ridge.. There was plenty of room for our family of 3, next time we’ll bring more friends! We had a wonderful time at Bear cabin. The place was great especially the deck with the hot tub! Thanks Kevin - glad you had a nice time. Fishing bear cabin was fantastic! We’re so glad you had a great time and we want to thank you for the wonderful review of our cabin. We would love to have you return if ever you choose to come back to the area. Fishing Bear cabin was a relaxing time! We had a great time in Blue Ridge and Fishing Bear cabin. Sometimes you just need a place to chill and that’s what we did. Our favorite place in the cabin was the downstairs area. It was the perfect spot to hang out and enjoy watching movies. It appeared to us that the downstairs area was a lot newer than the main floor. However, there was nothing wrong with the main floor. The shiplap and hardwood floors are beautiful! I’m OCD about cleanliness and for once, I didn’t spend the first few hours renting someone else’s house, cleaning. Downtown Blue Ridge is only a couple of minutes down the road, as well as Lake Blue Ridge. We really enjoyed taking the Shih Tzus downtown as they were welcome at most restaurants and some shops. Thanks to Doug and Jeanne for allowing us to stay in your cabin! We hope to return soon! Gosh Sheila, thanks for the super nice review. Our cleaners will be very happy with your remarks as are we! Yes, the downstairs was completely remodeled a few years ago following a burst water pipe. We'll be doing some work upstairs next - enclosing a bit of the deck to open up the living area and bigger kitchen area. We'd love to have you stay again so whenever you'd like to return, please keep us in mind. My hubby & I thoroughly enjoyed our stay! Coffee on the porch swing in the mornings & birds singing! My hubby & I spent 5 wonderful nights/days at the bear cabin! It was amazing...the house is awesome!!! The views, the porches with swings & rockers my favorite spot to enjoy coffee! 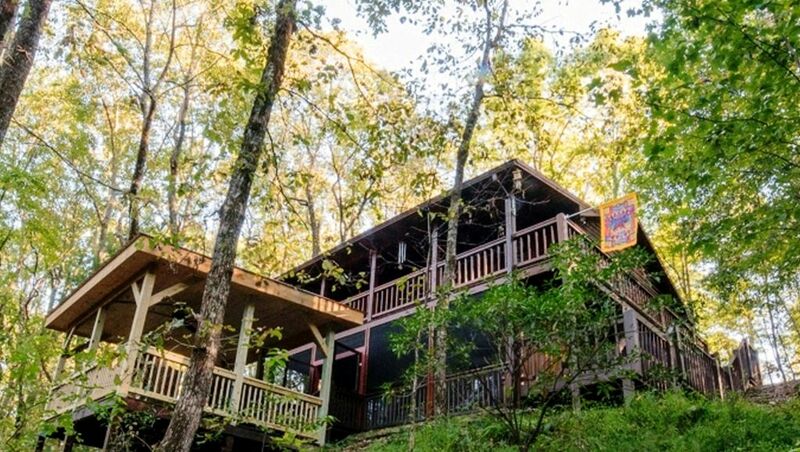 You almost don't have to leave the cabin with plenty of hiking right out the back door & an awesome hot tub to enjoy after a day of hiking is definitely a plus! I will definitely check out the bear cabin if staying in the area again! Thanks Jennifer - so glad you enjoyed your stay and we'd love to have you back next time you're planning a mountain trip. We have a number of guests who book each year and have done so for many years so maybe you'll be one of them! Thanks for taking the time to write about your stay and the nice review - greatly appreciate it. Two Night Minimum Parties over 6 will be considered - owner/renter communication in advance required Rental Rate: $125 per night.party of 4; SPECIAL - $100 per night for 2 guests;$12.50/per night per person for persons 3-6 All rates are quoted in US Dollars Tax: 17% (7% GA state tax & 5% County Tourist tax & 5% admin fee -on rental charges only - not deposit or cleaning charges) Cleaning: *$100 *party of 2-4 - additional charge for larger parties - $150 parties of 5 more. $20 pet fee per pet per night; $25 additional pet clean per pet. Certain breeds may require additional charges Damage deposit $150 for 1 -4 guests; $200 for 5-6; $250 for over 7. An additional pet deposit of $50 required with each pet. An additional amount may be required for certain breeds. Will consider parties up to 8 for special circumstances. Please check with owner in advance.